To be sure, we have commented extensively on what may (or may not) be behind the Libor blow out: if as many claim, the move is a benign technicality and a temporary imbalance in money market supply and demand, largely a function of tax reform (including the Base Erosion Anti-Abuse Tax) or alternatively of the $300BN surge in T-Bill supply in the past month, the Libor move should start fading. If it doesn't, it will be time to get nervous. But no matter what the reason is behind the Libor move, the reality is that financial conditions are far tighter as a result of the sharp move higher in short-term rates in general, and Libor in particular, which for at least a few more years, remains the benchmark rate referenced by trillions in fixed income instruments. Which brings us to a logical follow up question: ignoring the reasons behind the move, how does a higher Libor rate spread throughout the financial system, and related to that, how much notional debt is at risk of paying far higher interest expense, if only temporarily, resulting in even tighter financial conditions. Direct interest rate channel. Investment decisions, whether business investment spending or residential investment in housing, should depend on the socalled user cost of capital, of which the interest rate is one determinant. Tobin’s q. Interest rates affect asset prices, including equity prices. When financial markets increase their valuation of corporate assets, corporations have an incentive to invest in more of those assets by boosting capital spending. Consumption wealth effects. Asset prices affect not only the decision to invest, but also the decision to consume. An increase in house or equity prices historically has lowered saving rates and boosted consumer spending. Consumption intertemporal substitution effects. The trade-off between consuming today versus consuming in the future should be governed in part by the rate of interest that households earn when they forgo consuming today. Exchange rates. The competitiveness of firms that operate in global markets is influenced by the international value of the dollar, which in turn depends on the domestic-foreign interest rate differential. Bank capital channel. Banks’ willingness to lend will depend, in part, on their capital positions. This, in turn, will be a function of the prices of assets on their balance sheet, which are influenced by the level of interest rates. Balance sheet channel. The ability of households and businesses to borrow will also depend on the health of their own balance sheets, as the assets on those sheets serve as collateral for lenders. It is worth noting that for five of the seven channels (2, 3, 5, 6, and 7) the effect of interest rates on the economy is mediated through their effect on asset prices, where the asset can be real estate, corporate equities, or foreign exchange. For concreteness, JPMorgan urges to focus on the case study of equities: what is the appropriate interest rate to discount the stream of dividends when considering the value of a corporate claim: fed funds, Libor, or Treasury rates? Theory does not offer much immediate guidance. However, theory is clear that it should be a very long-dated interest rate. 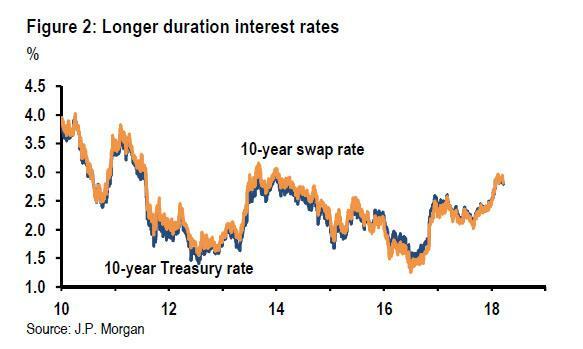 rate on 10-year Treasuries, and the spread between the two does not appear to be affected by the movement in the shortdated Libor-OIS spread. No matter which longer-term interest rate we look at, the recent dislocations in shorter-dated interest rates don’t seem to matter much for longer rates, at least not yet. In principle then, these dislocations shouldn’t affect asset prices, which is usually an important channel through which policy affects the economy. TO be sure, as of this moment, neither real estate prices nor the value of foreign currency appear to be suffering from a rise in the domestic discount rate, and it is this apparent dislocation that has puzzled so many, and while equity prices have been volatile, none of the recent volatility has been attributed to LIBOR by the analyst community. (4) the consumption intertemporal substitution channel. Regarding the first, JPM notes that the relevant hurdle rate for capital expenditures—whether financed internally or externally—should be longer-term interest rates, as capital goods are long-lived by nature. Recognizing this, we are forced back to the earlier point: longer-term interest rates have been unaffected by the widening in the front-end LIBOR-OIS spread. Finally, turning to the consumption intertemporal substitution channel, the relevant interest rate is the rate available to household savers. Most measures of nationwide deposit or money market rates show little flow-through from higher LIBOR rates to higher rates available to mom-and-pop savers - unfortunately for mom-and-pop - so one shouldn't expect this channel to be particularly powerful right now. Last, but certainly not least, the one channel that usually isn’t enumerated in monetary theory but is especially important in practical reality and is referenced in ordinary conversation is the interest expense channel. In the aggregate, interest expense equals interest income; someone’s higher debt payment is someone else’s higher interest receipt. Of course, if the spending propensity of the interest payer is higher than the interest receiver, things won’t net out to a zero. Moreover, deposit and money market rates haven’t moved in sympathy with LIBOR. To quantify the maximum potential importance of this channel, JPMorgan shows the following table laying out the total amount of nonfinancial borrowers’ obligations linked to LIBOR. According to this data, a 35bp widening in the LIBOR-OIS spread could raise the business sector interest burden by $21 billion. Whether or not that modest amount in monetary tightening is enough to "break" the market remains to be seen. Finally, for ordinary households, the increase in debt service costs as a result of the 3M Libor spike will mostly come through adjustable rate mortgages. The recent increase in LIBOR-OIS has added about $5 billion to the annual interest expense of households, or about 0.04% of the recent level of household consumption outlays, which is sufficient nominal to not generate a crisis; if it does, there is something very broken with the "recovering" US economy.